Pork tenderloin is a great choice for a weeknight meal when you want something that seems a little more elegant and fancy and can still be done in under 45 minutes or even thirty minutes. I usually but tenderloin when it is on sale and since they come in a package of two tenderloins I freeze one and make one for dinner so I can always pull one out to have for a meal. 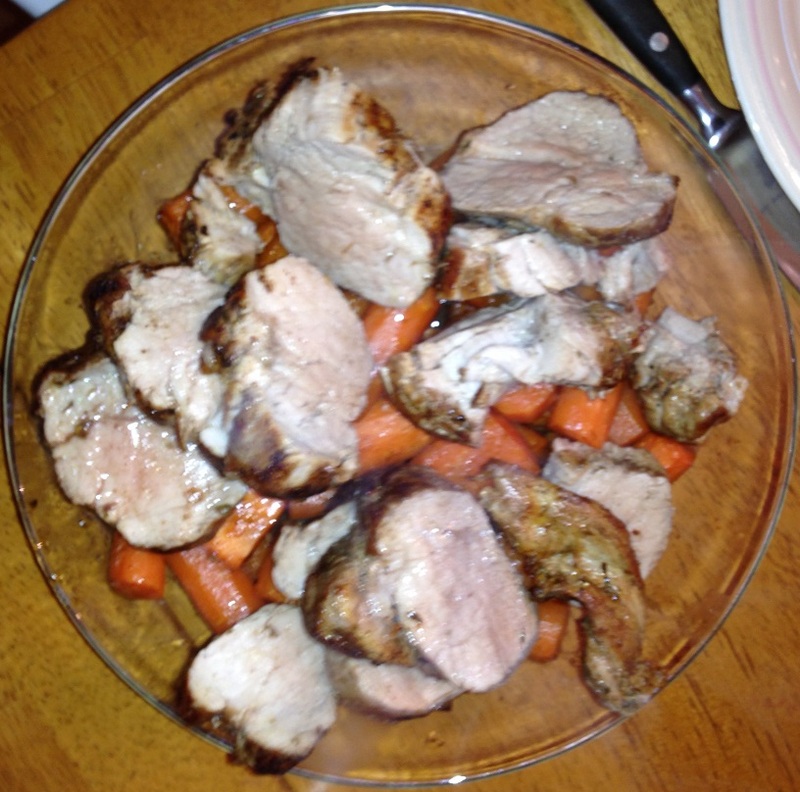 There are lots of great things you can do with the tenderloin – roasting, grilling, pan roasting, cutting it into medallions, cutting it up for a stir fry – but I really liked this option of adding some nice spices to the tenderloin and roasting it with some carrots for a nice meal. This recipe comes from Bon Appetit and is for a spice-rubbed pork tenderloin with roasted carrots. For the carrots: Arrange the carrots on a large rimmed baking sheet. Whisk 2 tablespoons of water and all of the remaining ingredients in a small bowl; pour the mixture over the carrots and toss to coat. Cover the carrots tightly with heavy-duty foil. For the pork tenderloin: Preheat the oven to 400°F. Roast the carrot mixture covered until the carrots are just tender, about 30 minutes. Meanwhile, arrange the pork tenderloins on another rimmed baking sheet. Stir the oregano, cumin, chile powder, smoked paprika, and 1 teaspoon of coarse salt in a small bowl; rub the mixture all over the tenderloins. Heat the olive oil in a heavy, large nonstick skillet over medium-high heat. Add the pork to the skillet and cook until the pork is browned on all sides, about 5 minutes. Return the pork to the rimmed baking sheet. Remove the foil from the carrots. Nestle the pork among the carrots on the baking sheet, arranging the carrots in a single layer around the pork. Roast uncovered until an instant-read thermometer inserted into the center of the pork registers 145°F, stirring the carrots occasionally if they are beginning to caramelize, about 18 minutes. Let the pork rest for 5 to 10 minutes. Transfer the pork to a work surface. Cut the pork crosswise into 1/2-inch-thick slices. Arrange the carrots on the platter. Top the carrots with pork slices, drizzling any pan juices over the pork. It is a very simple dish that gets great flavor from all of the spices used on the pork. You get a little bit of heat from the chile powder used on the carrots and pork and little bit of sweet from the sweetness of the carrots and the honey in the glaze. The original recipe calls for the use of whole baby carrots, which would work really well here, but I didn’t have any on hand and just went with carrots instead. Also, I only made one pork tenderloin instead of two so I did cut back on the recipe a bit for just one so it was not overloaded with spice. In either case, it is a great meal that can be ready and on the table in under and hour.